Goldfish Pacific Kitchen (web site, 1118 Mainland Street, Vancouver, BC, Canada, phone: 604 689-8318) offers West Coast and Pacific Rim cuisine in a trendy, upscale, and lively atmosphere. 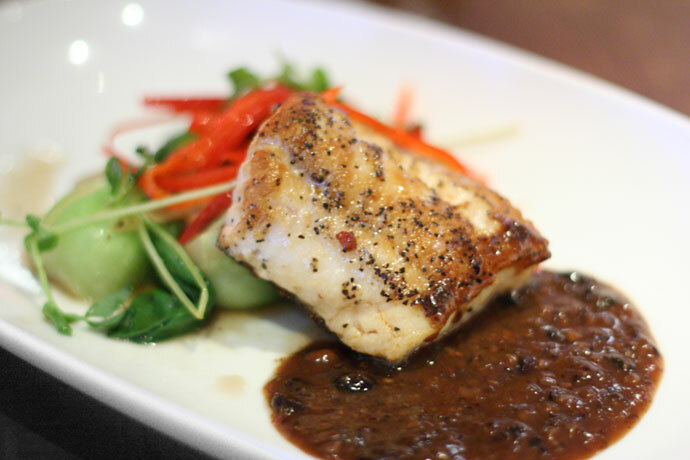 This downtown Vancouver restaurant focuses on seafood, with selections such as the ling cod (served with ginger, baby bok-choy vegetable, and a black bean reduction, $22, pictured below), and the wild BC salmon (with Asian BBQ sauce and a snow pea salad, $22, also pictured below). 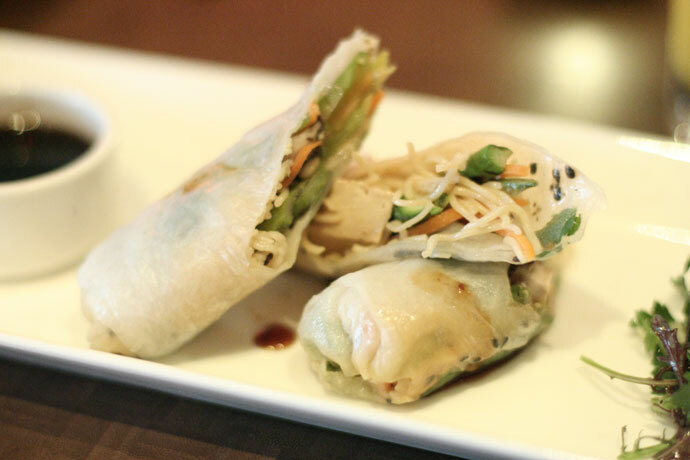 We also tried and enjoyed the miso sake asparagus roll ($8, with mushrooms, marinated tofu, spicy hoisin glaze, pictured below), the wok tossed squid (not pictured, $8), and the creme brulee for dessert (pictured below, $8, served with yummy shortbread cookies). The restaurant has hip, tasteful decor that is reminiscent of the modern restaurants in recent James Bond movies, and can easily accommodate large groups or provide a more intimate atmosphere for a romantic dinner. 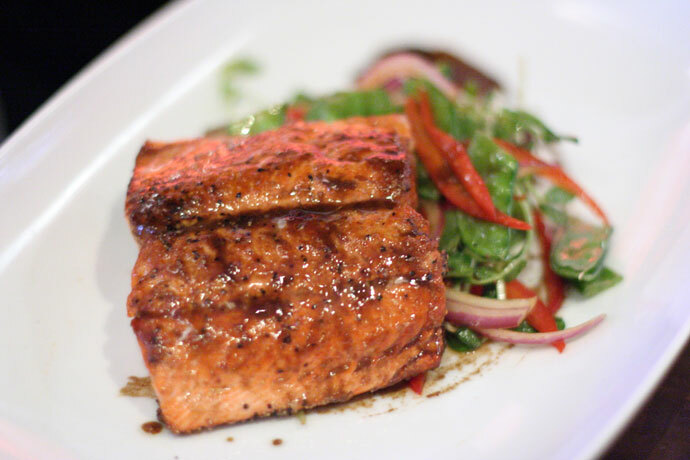 Goldfish Pacific Kitchen also has an extensive wine list and a lively bar area that is popular with the upwardly mobile urban socialites of Vancouver’s “yuppie” Yaletown neighborhood. Unfortunately the restaurant does not cater very well to vegetarians, with only two vegetarian main courses (although the kitchen would most likely accommodate special dietary needs if required). Valet parking is available, and the restaurant is quite near to the Canada Line train station which will be operational in 2009. Visit their web site for the Goldfish menu and more info. Miso sake asparagus roll at Goldfish Pacific Kitchen ($8) – the sake is quite strong in this dish!! 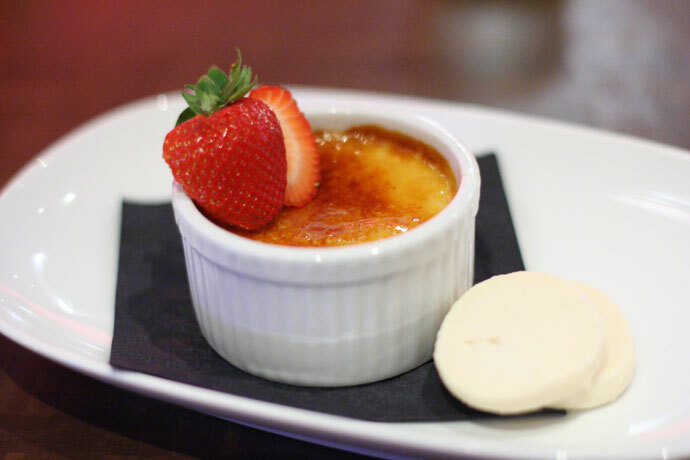 Creme Brulee for dessert ($8). The shortbread cookies were so tasty! 10,508 views. This entry was posted on Saturday, May 3rd, 2008 at 1:11 am	and is filed under Asian, Bar, Casual, Crab, Creative Dishes, Dine Out Vancouver, Downtown, Fine Dining, Food Photos, Fun atmosphere, Fusion, Large Groups, Lively, Lunch, Lunch Specials, Modern Decor, New Restaurants, Patio, People Watching, Raw Oysters, Restaurant, Seafood, Small Plates, Steaks, Tapas, Tourist Attraction, Trendy, Upscale, Vancouver, Vancouver Restaurants, Yaletown. You can follow any responses to this entry through the RSS 2.0 feed. You can skip to the end and leave a response. Pinging is currently not allowed.